The 2011 Sea TURTLE teen diving expedition is back in Boston. In this post, Libna shares her final thoughts on her experience with the program. Throughout Sea TURTLE, I learned a lot about myself. SCUBA diving and seeing all the beautiful and amazing life under the water made me realize that I want to further my education in environmental studies and marine biology. I also learned that I can survive on a boat with the same people for ten days. 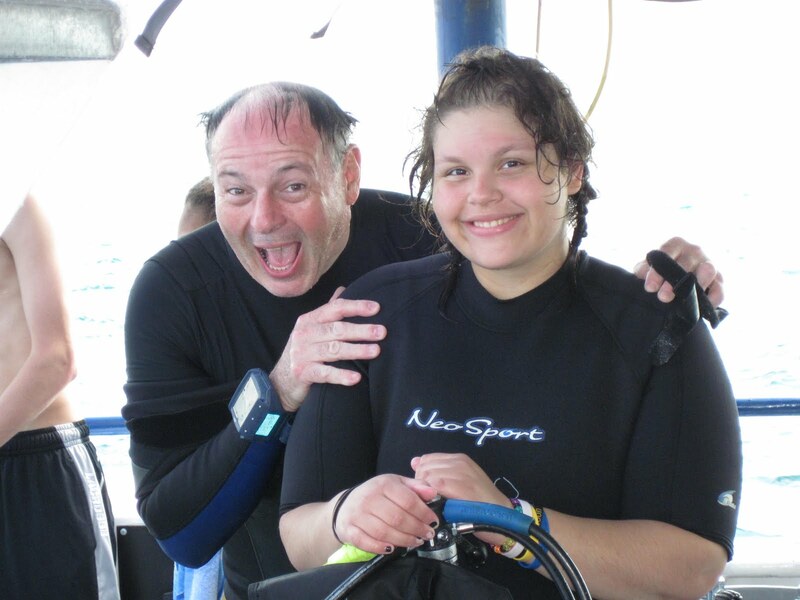 Libna immediately after her SCUBA certification dive! Who's more excited, Libna or Mike? There are a lot of connection that I have learned between my life in Massachusetts and the marine habitat of the Bahamas. No matter how far away we are, its still our world that we have to protect. I am going to be more aware of what I do here so I won’t affect marine habitats in the Bahamas or anywhere else in the world. Perfect timing: We saw this beautiful nurse shark (and hitch hiking shark sucker) on our last dive in the Bahamas! My perspective of the ocean has changed a lot since Sea TURTLE. I have a new love for the ocean and I want to do what I can to protect it. I feel like I truly understand the importance of what I tell other people about the ocean. Its one thing to just talk about it, it’s another to actually go see it. Just imagining those habitats not being there anymore is a scary thought. A lot of animals rely on those corals as a home and shelter, it would be wrong to get rid of them. When I saw the nurse sharks just sleeping on bottom, it made me realize that the ocean is its home. I don’t want anyone ruining that. Yay, Libna! I'm sure your profound discoveries will help you learn and teach in the future! wow Libna. Beautiful words from a beautiful person!